The Grey Whistler according to HANZAB is unmarked and drab, grey-brown or grey-olive according to location - not only the plainest it is the smallest (14.5 cm) of all our whistlers. 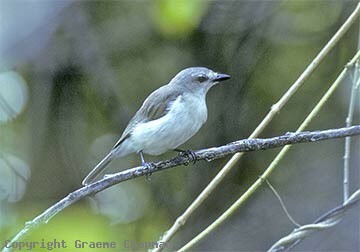 In the 1926 Checklist it was listed as two species, P. simplex, the Brown Whistler from the Top End inhabiting mangroves and various other humid habitats between Port Keats and Melville Island, and P. peninsulae, the Grey Whistler which is found mainly in rainforest between Cape York and Townsville. 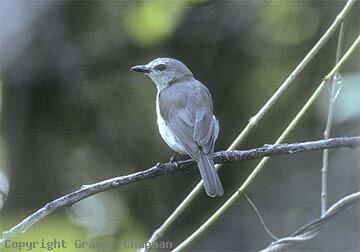 These days, these two populations are regarded as subspecies of a larger complex which extends through New Guinea and nearby islands. Very little is known about their life history. Results of some bird banding have shown that birds in the NT are fairly sedentary whereas general observations in NE Qld suggest that in winter there is a movement from the highlands down to the coast. When breeding, like all our other whistlers, they live in territories as simple pairs (no co-operative nesting). I can find no illustration of a juvenile - described in HANZAB as being fairly rufous overall. 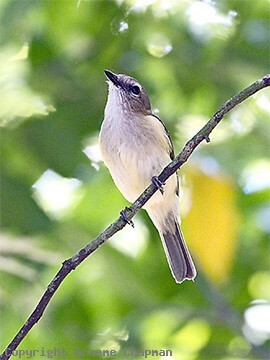 Grey Whistlers are fairly unobtrusive birds - they forage largely in the middle level of the vegetation and although they sometimes sing quite long sessions, the song is sweet and restrained, much quieter than our other whistlers. They have a rather peculiar range - missing from the extensive mangrove systems of the southern Gulf of Carpentaria. On my last visit to Karumba, I reckon I saw and heard one out in the mangroves at Karumba Point, but I was unaware of the significance of the observation at the time. Worth keeping a lookout there. 406201 ... Grey Whistler, subspecies simplex, Darwin N.T. 406202 ... Grey Whistler. 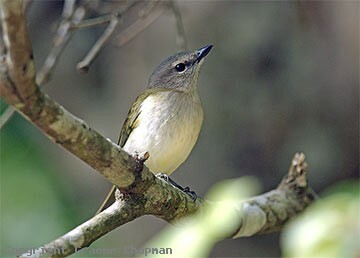 subspecies simplex, Darwin N.T.